It's summer! For most of us, summer means days spent seaside and poolside. It's also a time when many of us spend more time exercising. Heat and humidity levels are at all-time highs during these months, and it's important to stay hydrated. Phenom Coconut Water is the perfect solution to your hydration challenges. With electrolytes, multivitamins, and antioxidants, Phenom Coconut Water offers nourishment, replenishment, and hydration. It's available in 4 varieties and 6 delicious flavors. The Coconut Water Drink is 100% natural, has zero fat, zero cholesterol and zero sugar added and only 45 calories per serving. I received 3 samples, Blueberry Pomme (Antiox), Acai Peach (Energy), and Pineapple Punch (Mega V), and I was anxious to put them to the test as I have just started a regular exercise program. After an hour-long workout, I drank a serving of the Acai Peach Energy. It was the best sports recovery drink I've had in a long time. Phenom replaces electrolytes lost during workouts and works to bring potassium levels back to normal which plummet when you sweat. Phenom Hydro contains 17 times more potassium than the leading sports hydration drink. Getting used to the taste and texture of coconut water was an adjustment. It's creamier and smoother than regular water. My favorite flavor was the pineapple punch. Since I like my flavored water to have a touch of sweetness, I added some agave nectar to my Phenom Coconut Water. Whether you are looking to replace hydration, electrolytes and minerals lost during rigorous workouts, or whether you are looking for a drink for the beach or pool, Phenom Coconut Water is perfect for both occasions. 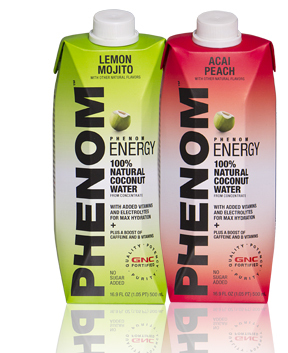 Phenom Coconut Water can be purchased at GNC, in stores and online. Disclosure: I received 3-16.9 fl. oz. bottles of Phenom Coconut Water to facilitate this review. I received no additional compensation to write this product review. All opinions expressed herein are solely mine. To view my full Disclosure Policy, click here.